From America to Japan, June was a month of rebooting in the world of pop culture. This meant some Asians were fortunate enough to receive new opportunities. Other Asians, however, got the boot. Despite landing her dream job as a co-host on the “Today Show” last June, news journalist and personality Ann Curry was recently demoted from the show to much media spectacle. Curry, who is half Japanese, became co-host of the iconic morning news show as a replacement for former “Today” host, Meredith Vieira. Curry had previously been a newsreader on the show for 14 years. Curry fielded much criticism this last year, such as critiques of her stiff anchoring personality and her lack of chemistry with co-host Matt Lauer. She was even cited as responsible for the show’s slip in ratings. After a brutal negotiating process over the last few months, NBC News executives decided to replace Curry with her “Today” colleague, Savannah Guthrie. Do we want to feel sorry for Curry? Maybe. It must be difficult to endure so much negativity from both critics and fans while working in a dream job. To add more salt to injury, her departure from the show has been, well, anything but mournful. While Vieira had a two-hour farewell show dedicated in her honor — which included a sentimental clip show and musical performances — Curry had five minutes to tearfully say goodbye on her final segment of the show. But don’t have too much pity. Even though she was demoted, Curry will still serve as an international correspondent for NBC while raking in a cool $10 million as part of her severance agreement. Someone please hand me a handkerchief to wipe these crocodile tears from my eyes. One of the things I love most about summertime is catching summer blockbusters in theaters. There’s something so relaxing about slipping into an air-conditioned theater on a hot summer day. “The Amazing Spider-Man” is one of the biggest buzzes at the box office this summer. Meanwhile, on the complete opposite side of mainstream, the indie crime thriller “The Girl from the Naked Eye” recently open with limited release across America. The film focuses on an ex-gambler-turned-driver for a prostitution ring who embarks on a manhunt for the murderer of his friend (who just happens to be a call girl). Directed by Chinese American screenwriter and director David Ren, the film stars Chinese American actors Jason Yee and Ron Yuan. This film has a dark and gritty feel that is reminiscent to the South Korean thriller movie, “Oldboy.” So, if that film appealed to you in the past, “The Girl from the Naked Eye” should be up your alley as well. 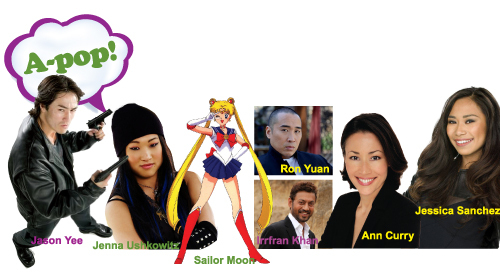 Childhood anime favorite “Sailor Moon” is getting a makeover! Word on the street is that in celebration of the Japanese animated show’s 20th anniversary, the show will return with a new, serialized anime — featuring the same loveable characters, of course — in summer 2013. While the voice talent has yet to be secured, Japanese pop group Momoiro Clover Z will provide the show’s theme song. After the show makes its run in Japan, the anime will be distributed worldwide. My guess is that this reboot will be geared to both long-time fans of the show as well as potential new and younger viewers, so no demographic will be left unattended to with this new version. I grew up pretending I was Sailor Moon (or sometimes Sailor Mars depending on my mood), so news of this reboot is super exciting! Speaking of “Glee,” Jessica Sanchez, whom most audiences remember as the runner-up from the most recent season of “American Idol,” has been confirmed to guest-star in a multi-episode arc on “Glee” next season. Sanchez, who is half Filipina, has quite the pair of pipes on her, so roping her in for a “Glee” guest-spot was a smart move on FOX’s behalf. And finally, speaking of Sanchez, she is also in talks for the lead role for the film adaptation of the Broadway classic, “Miss Saigon.” First of all, go Sanchez! This is clearly your time to shine — runner-up position on “American Idol” be damned. If chosen, Sanchez would be following in the footsteps of the great Filipina singer and actress, Lea Salonga, who performed the lead role of Kim in the original Broadway version of “Miss Saigon.” Other singers are reported to be in consideration for the role of Kim, including Filipina pop singer Charice as well as Filipina American actress Anna Maria Perez de Taglé.